Driving into Harpers Ferry on a foggy night feels like coming up on an American Brigadoon: The perfectly preserved 19th-century village has an other-worldly atmosphere, far away from big city bustle. It’s almost jarring to see modern-day hikers with high-tech gear walking by us; the park rangers dressed in historical costumes actually look like they belong here. In geography, the word palimpsest means a place or landscape in which something new is superimposed over traces of something preceding it. There is no better word to describe Harpers Ferry. You can feel the past centuries here, and the town’s strategic location at the breathtaking confluence of the Potomac and the Shenandoah rivers have ensured its place in history. Best known as the location of John Brown’s raid and uprising, it was one of the first U.S. armories and arsenals and a hard-fought Civil War prize. The charms of Harpers Ferry and proximity to Washington, DC, via car, train or canal and its physical beauty have contributed to its popularity as a summer vacation spot and getaway for outdoor activists and history buffs alike. Harpers Ferry is also now the home of Tarver King, chef of local and national renown whose culinary leadership at The Restaurant at Patowmack Farm helped win that establishment (and the chef himself) every accolade, including James Beard finalist for Best Chef, Mid-Atlantic; RAMMY’s 2017 Chef of the Year; and featured in Wine Spectator, Bon Appetit and Food & Wine magazines. He’s also a really nice guy, a passionate fly-fisherman and a great fan of his family’s hometown, Harpers Ferry. 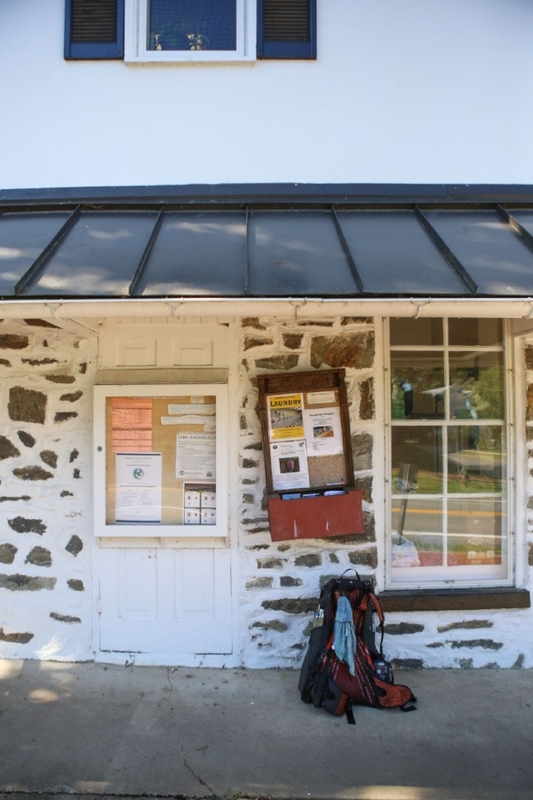 Appalachian Trail Conservancy Headquarters and Visitor Center. Tarver tours me along lower and upper downtown. A large part of lower downtown is under the purview of the U.S. National Park Service’s Harpers Ferry National Park, accommodating a deep dive with the rangers into the storied history of this burg. In fact, there is so much history here that some of it seems to come from another dimension. Harpers Ferry is known for its ghosts, and Tarver points out a famous haunted house. “You absolutely have to go on the Harpers Ferry Ghost Tour, it is one of the best things to do—lots of history, but you’ll want to make sure the lights are on when you get home,” Tarver says laughing. Harpers Ferry boasts great fishing streams, but it may be best known for being the mid-point of the Appalachian Trail; a popular spot to hop on or hop off. If you are eager for your own Wild moment and if hiking the great trail piques your interest, you are in luck. The headquarters of the Appalachian Trail Conservancy is located here. Also, one of Tarver’s favorite shops for gear of all sorts, Harpers Ferry Outfitters, a well-stocked and friendly general store for all things outdoorsy. Sour ball candy from True Treats Historic Candy. Talk of hiking left us needing coffee and a bite to eat. Luckily, coffee shops and sandwiches abound along Potomac and Washington streets. Our first stop was Battleground Coffee for a big pour of caffeine and sandwiches. If you are more in the mood for frozen custard, try the Coffee Mill. Then we hit one of the most unique candy stores I’ve ever visited, True Treats Historic Candy. Tarver pointed out to us that the store’s candies are grouped by their place in candy history: One section was Colonial candies; another, Civil War era; then Victorian favorites and so on. Owner Susan Benjamin is a well-known candy expert and historian. Her most recent book, Sweet as Sin: The Unwrapped Story of How Candy Became America’s Favorite Pleasure, made the Smithsonian’s list of Best Books About Food for 2016. Like an edible museum, the candy is curated with its origin story and available for purchase. Local items on display at Vintage Lady. We left with several sweet treats and popped into one of Tarver’s favorite jewelry stores for the women in his life, Mary Adams Accessories. Pretty baubles abounded, including several pieces of jewelry made with the West Virginia state gem, chalcedony, a semi-precious form of fossilized coral with an aqua blue color. Then a few doors down is Vintage Lady, which has locally made food stuffs and fun gift items (even if they are for yourself). Town’s Inn and Mountain House. Settling in for a good local meal at the quaint Town’s Inn and Mountain House is a charming idea. Two renovated 19th-century buildings provide food and some lodging. The Town’s Inn has a full-service restaurant, Bistro 140, that serves daily from 11 am to 7 pm. Next door, the Mountain House has hostel-type lodging as well as two rooms and a café and sundry shop, with perfect grab-and-go food options for hikers and tourists alike. Breakfast at the Angler’s Inn. 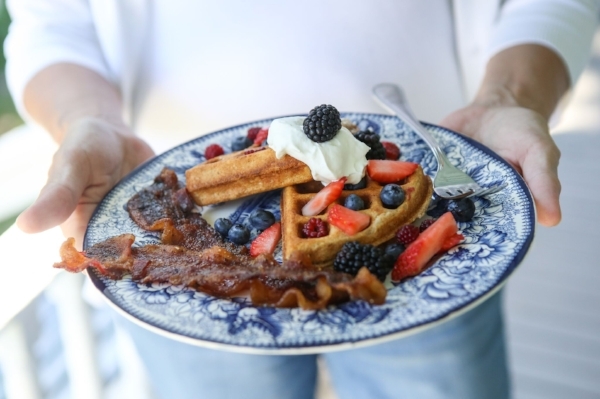 Delightful overnight options are found at the Angler’s Inn Bed & Breakfast, where owners Bryan and Debbi Kelly have comfortable rooms and outstanding breakfasts. True to the Inn’s name, many guests book months in advance to fish the waters of the Shenandoah and Potomac with Bryan; both the rivers and the guide are well-known by serious anglers. Bryan has 25 years of guide experience and the rivers have both been named as in the top 10 of smallmouth bass spots by Fly Fisherman Magazine. If you are looking for a light tackle or fly fishing experience, you’ve now got a plan. Harpers Ferry is an easy 70-mile drive from Washington, DC, and an even easier train ride with a short walk to the town. For Tarver, who plans to put down even deeper roots with another restaurant project nearby soon, the appeal is clear. The town also looks forward to another draw: An investment team has a redevelopment plan underway for the Hill Top House Hotel, currently a stunningly derelict resort with the most incredible view of the river confluence and valley. It is slated to become a 122-room resort and spa by 2021. Even more exciting for potential visitors from Washington, DC, the resort will include eats by José Andrés and ThinkFoodGroup. Terri Wilson makes delicious pepperoni rolls at her bakery, A Step in Time. In addition to a state gemstone, West Virginia has its share of food legacies. Even though I’ve yet to find a “slaw dog,” Tarver and I did come upon a delicious example of a pepperoni roll at A Step in Time, in a renovated Victorian house just down the street in Bolivar. The proprietress and baker, Terri Wilson, a true coal miner’s daughter, told us the story of her mother’s West Virginia Pepperoni Roll: Her Mama Jo, she says, made rolls that fed seven children and served as lunch for her coal miner husband. The pepperoni roll, a soft yeast bread stuffed with pepperoni, could withstand a day in the mine, maybe stuffed inside a pocket or a bag, and was filling enough to fuel a tough day’s work. Tarver casts in the early morning on the Shenandoah River. And that’s the thing about Tarver King and why—if you haven’t—you need to eat what he cooks. In addition to being a chef, he’s an artist, and he brings that creativity to the plate. The pepperoni roll is just one example of how deeply he will go down a rabbit hole to make something the best version of itself. We are staying tuned to see what Tarver’s next project will be. In the meantime, visit him at Patomack Farms, Thursday through Saturday for dinner. And lunch Saturday and Sunday. Or catch him, with a fistful of pepperoni roll, in Harpers Ferry.